St Mary's holds a long established place in the village of Stansted Mountfitchet, Essex. 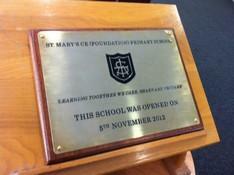 In November 2012 St. Mary's moved into a beautiful new building - our fourth home since our foundation in 1835. St Mary's is a happy and ambitious school with a strong community ethos. We recognise the importance of children, families, staff, governors, St. John's Church and the wider community working in partnership, in putting our core principles into practice. Our school curriculum and pastoral care are planned to support all aspects of pupils' development. As a school community we strive for successful learning, supportive relationships, creativity and preparation for their future, all in an environment where everyone matters. …in a community where curiosity, originality, perseverance and independence are encouraged and celebrated. Our objectives are to set standards of excellence in the teaching and learning experiences we offer and to give our pupils the opportunity to acquire knowledge, understanding, skills and attitudes which will be the key to their success in future education and adult life. We intend to meet the needs of all our pupils by involving them in an appropriate, creative and challenging curriculum. We work to achieve efficient management of school finances and to provide a pleasant, safe and stimulating learning and working environment for our pupils and staff. We aim to develop and sustain a happy and secure environment in which our children gain in confidence and independence, while learning to accept responsibility and to make a positive contribution to a caring school environment.